Fun 3 Day Barcelona Itinerary: Atrractions, Art and Culture! “You haven’t been to Barcelona? !” This was the surprised reaction I got throughout last year. So I made it a duty to explore the most visited city in Spain. Thanks to a kind friend from Barcelona, I didn’t pay anything for accommodation. Below is a 3 day Barcelona Itinerary to get you started. Placa d’ Espanya or Plaza de España is the most popular location where many activities take place in Barcelona. Just walking around Plaza de españa you’ll find interesting places to eat, sights to see and things to do. The Catalonian National Art Museum and many other Museums are also located in this plaza. Make sure to climb up in order to enjoy a beautiful sight of the entire plaza. I advise you to come here during the day and night. During the night, the Museum lights up with different rays of lights reflecting toward the sky. One doesn’t simply talk about visiting Barcelona without mentioning the Sagrada Familia at least once. Barcelona is synonymous to this grand architecture. The Sagrada Familia which means the Sacred Family was founded by world-renowned architect Antoni Gaudi and built in 1882 (162 years ago!). The Cathedral is still in construction and yet to finish in 2028. It is 550 ft (170metres). You can take a cool selfie in front of the Cathedral or go in for 15 euros. 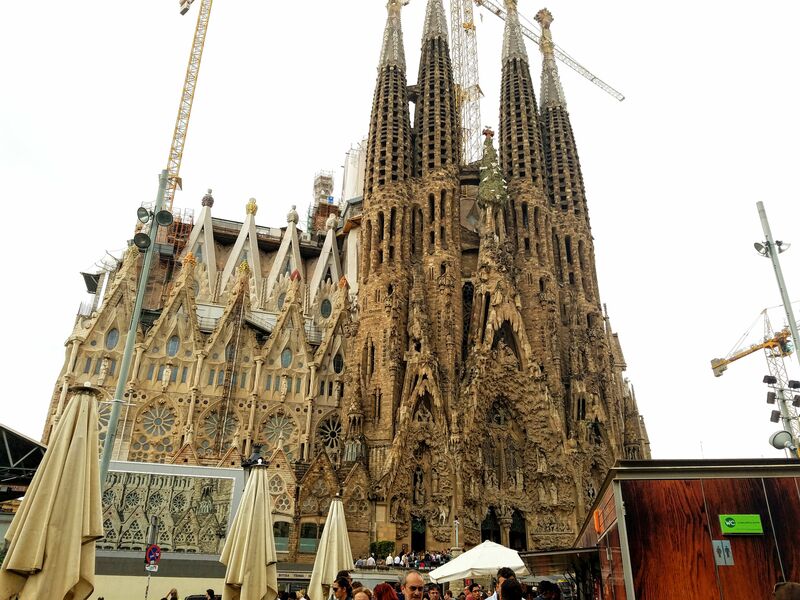 A fun fact of the Sagrada Familia is that the only funding it receives is from tourist visits. This is another popular hot spot in Barcelona. Las Ramblas is a combination of 5 streets. It is the spot where locals and tourist go to. Here you can find all the Halal food you need and also masjids to perform prayer. Halal food in Barcelona isn’t hard to find. Las Ramblas to Barcelona is what Lavapies is to Madrid. I stopped by here for lunch at Paloma Blanca. The food was delicious! One of the fun things to do in Barcelona is to check out the Casa Batllo. It was by far my favorite activity. I personally think that Gaudi is a genius for having such a creative imagination during his time period. Mr. Batllo hired Gaudi to design his house, hence the name. The Casa Batllo perfectly reflects his work. Not only would you be inspired by the design of this house turned Museum, but the interactive video engages you and brings each design to life. Normally when I go into museums, I find it boring listening to the audio regarding the history of painting or historical events but this was a game a changer. See for yourself! For Casa Batllo tickets check here. The Montjuic castle is an old military fortress built in 1640. It is currently Barcelona’s Municipal facility and Museum. The Montjuic castle is on a hill overseeing the Mediterranean sea. The ride to the castle itself can be fun if you decide to hike up there (free) or get on the cable car (8 €). Using these methods you can see the entire astonishing city of Barcelona. Although the list for my day 1 activity looks small, It took me 12 hours to explore all the places above. I started my adventure at 10 a.m and came back around 10 p.m. Naturally, I was exhausted and went straight to bed once I got to my friend’s apartment. This is an awesome Museum that showcases the history of chocolate in Europe, its origin and the process of making it. In the museum, you’ll find chocolate sculptures of famous characters like the Asteriks, Marvels, Minions, Stuart Little, Don Quijote etc. It is a fun and an educative place to spend with friends, family or children. A cool thing about the Museum is that the entry ticket is a chocolate bar that you scan to get it in. I must say after the tour, I started craving something sweet to eat. Barcelona has a lot of parks, but Parc de la Ciutadella was highly recommended. I could see why after my visit there. For an early Sunday Morning, Parc de la Ciutadella was already bustling with activities. There were people taking part in some type of Tai chi exercise, others drumming to an ongoing marathon, while some people dance on the grass. It felt really lively. Parc de la Ciutadella was created in 1869. It’s a large park with several sites inside. A majestic fountain, a pond where you can ride a boat, a parliament, a zoo, A large Mammoth etc. This is where the FC Barcelona team plays. I am not a Futbolista but I thought the right thing to do was to pay homage to Madrid’s rival. A really cool park inspired by Architect Gaudi. This is another must visit sight in Barcelona. As you go down the hill towards the park you’ll find the Architect’s house which has a very distinctive shape. You’ll also find cave-like corridors whereby buskers play soothing music. Once you have come down the hill, you will find a long line of tourists standing in line to either purchase a ticket or enter. Skip that line, turn left and go straight on until you see the entrance to the park. There you can purchase your ticket and enter. Once Barcelona’s best-kept secret. If you have the stamina and strength you can climb up the hill to get to the top of the bunkers. I must tell you the hike is worth every tired breath. Here you can enjoy a 360 view of Barcelona. The best time to come up here is during sunrise and sunset. Bunquers del Carmel was the perfect way to end my day. Federal cafe offers the best brunch in Barcelona. The cost of the food is average but what I love the most is the way the food is served. This restaurant is great for Instagram foodies. December, January & February, daily from 10 am to 6 pm. March & November, daily from 10 am to 7 pm. April & October, daily from 10 am to 8 pm. From May to September, daily from 10 am to 9 pm. This large park with lots of open space is also known as the Parc l’Escorxador , a former Slaughterhouse. 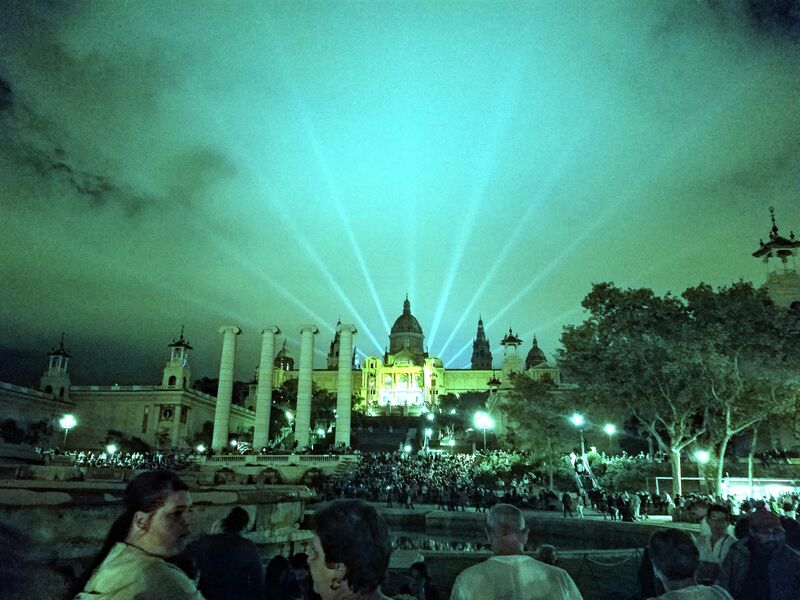 It is visited by tourists and locals alike and a great start to exploring Plaça Espanya. Located in the Joan Miro foundation, This museum pumps pure mercury through its fountain. It’s definitely a sight to see. Note: Mercury is dangerous when in contact with the body. A glass frame is placed around the fountain due to its toxicity however the site is a beauty. I didn’t get to go to all the places, I planned but these are some of the best places to enjoy a meal in Barcelona. Try and eat in at least one of them before you leave Barcelona, you’ll thank me later. Thanks for the post. Very informative and inspiring. I can’t wait to visit Barcelona. Do you have any recommendations for places to stay? Does your friend rent her apartment out!? Thanks! Hello Aabida! I stayed with her family, unfortunately they don’t rent it out because they live there. Depending on what you are comfortable with, I would suggest an Airbnb. Very informative itinerary post. I want to visit Spain/Barcelona for sometime. Saving your post for future reference. You did a lot for only 3 days! great post and I love how you give year round times for things along with prices. Thanks! The food from Federal Cafe looks really yummy! I bet the chocolate museum was fun. I visited one in Belgium last year. It’s always cool when you can find out of the norm museums like that. Haven’t been to Spain yet, but Barcelona is clearly worth a visit! Barcelona is big! I have been twice and I think I have only done half of what you did. To my defense, I was really sick last time I visited, so, I moved slower than usual. In addition to the places you have in here, the Palau de la Musica Catalana and the Santa Caterina Market are worth a visit. They are not crowded at all (which is a miracle in Barcelona). I did go to the Camp Nou against my will (because of my husband). I only spent one night in Barcelona and definitely missed a few of your suggestions. I hope I can make it back one day. Great tips, I’ll definitely add this to my already growing list of must do in Spain. Good to know I need at least 3 days in Barcelona. Thanks for sharing. These are some great tips especially for someone visiting Barcelona for the first time. Plus anything free has my name on it. Barcelona is one of my favourite cities! it is something like all in one: stunning architecture, museums, colors, people, food (omg! ), parks, sea and great nightlife. Although crowded, I always enjoy it out of the tourist places the best. I’ve never seen the bunkers though, so thanks for the tip for the next time!